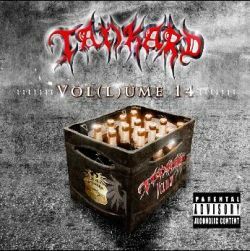 Formed in 1982 by Andreas Geremia (vocals), Frank Thorwarth (bass), and then-guitarist Axel Katzmann, the German thrash outfit Tankard has become synonymous with alcohol-fueled reckless abandon of the most metallic kind. Plying their trade alongside Germany's budding thrash legends - Sodom, Kreator, and Destruction - Tankard drew in a loyal, if not wide-ranging, following. As the years passed, the band continued to churn out album after album of unadulterated party thrash without ever realizing the success enjoyed by their countrymates. Perhaps it's been stylistic stagnation that has held Tankard back, but there's no denying Tankard's knack for delivering quality, thrashtastic metal. The simply titled Vol(l)ume 14, Tankard's fourteenth studio album, delivers exactly what the band has been producing for nearly thirty years. Musically, there's not much new happening on Vol(l)ume 14 that hasn't already been heard on a previous Tankard release. The first track, "Time Warp", could raise some eyebrows (it certainly did mine) because of its modernistic yelping vocals and mellow acoustic intro, but the remainder of the album quickly settles in to familiar Tankard territory. Andy Gutjahr, who replaced Katzmann after 1998's Disco Destroyer, consistently dishes out catchy riffs and admirable solos. In addition to the album opener, Gutjahr puts together some attention-grabbing chords on "Beck's In The City" and "Fat Snatchers (The Hippo Effect)" - the latter being the track that edges out the others on the album as the standout. If you're looking for some flashy or innovative axework, then Vol(l)ume 14 (and Tankard) isn't for you. If - like me - you just want to throw up the horns and enjoy some real old-school riffs, no song on this album will disappoint. Frontman Geremia's voice is as gravelly as ever, fitting in perfectly with my perception of the ideal thrash vocalist. With just a hint of a Teutonic accent, all of the mostly cheesy lyrics are easily decipherable and - if you so choose - repeatable. The years have been considerably kind to Germeia's throat, his aggressive mid-range consistently strong. Given Tankard's history, it's no surprise that most of the songs have something to do with alcohol and/or partying. "Weekend Warriors" is a typical ode to the 9-to-5 grind and "Rules For Fools" points out the perceived dependency that metal has on beer. One of the few ways that this album differs from previous Tankard efforts is the seriousness of some of the lyrical content. For instance, "Black Plague (BP)" is a not-at-all subtle take on the BP oil disaster in the Gulf of Mexico, while "Condemnation" reflects upon the biased and agenda-driven news media. Such seriousness, along with leveraging modern production values, sets an interesting precedent that I hope is further expanded upon as the band re-enters the studio. Fans will know exactly what to expect on Vol(l)ume 14 and should go directly to their favorite CD outlet to pick this one up. For those who've yet to experience the Tankard charm, this album is as good as any to get a swig of what these Germans are all about.